Our thoughts have turned to spring even if the weather hasn’t quite yet! Are you ready for some brighter days inside and out? We are, so I’ve turned my thoughts to some spring decorating inside to brighten the mood a bit. If you have been here before you know I’m learning to sew. Check out my completed projects on my sewing page. To begin my spring decorating, I’m implementing a frugal decorating trick which is to use slip covers on your existing pillows for a quick update. I found this adorable bright watering pot in a local thrift store recently and fell in love with those bright colors. I ran it through the dishwasher and it survived nicely which makes me smile. I love dishwasher safe décor, don’t you, especially with spring cleaning just around the corner. It is currently perched amongst my Faux Iced Winter Branches on the mantle in the den and catching my eye and my thoughts daily serving as my inspiration piece for some spring decorating in the den. 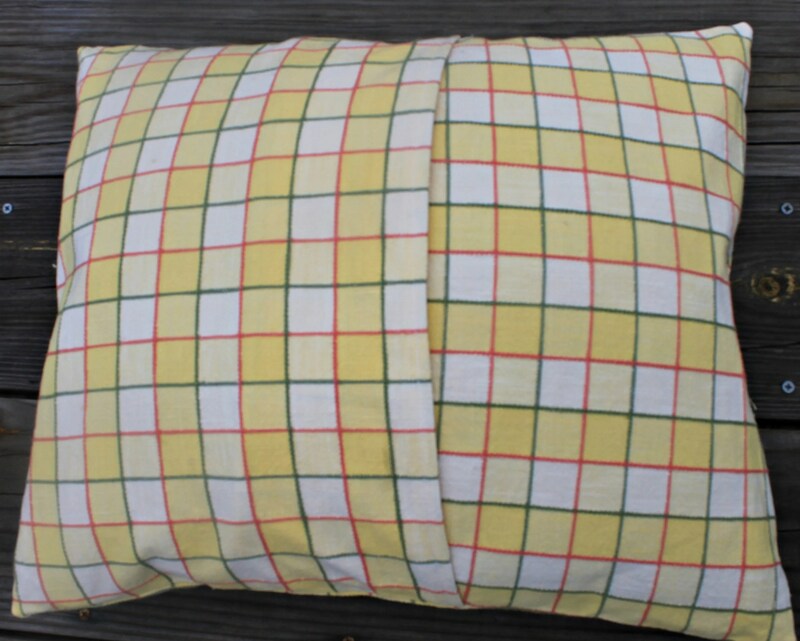 Let’s make some pillow covers! 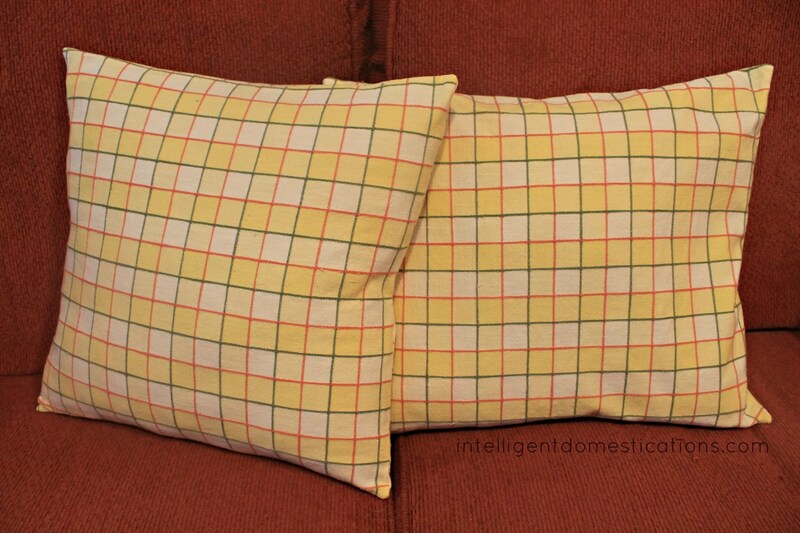 I actually purchased the pillow cover fabric on the same thrift shopping trip as my inspiration piece. You cannot beat .99 for a yard of fabric! Since I am still learning and very apt to make a costly mistake, I’m good with bargain fabric! Measure you pillow to determine the size. The front piece will be one big square as seen in photo above(folded back on top). Add about an inch to your measurement to allow for the seam. The back piece will be cut into TWO PIECES to allow for the overlap pocket, see photo above. Measure you back piece of fabric about 5 inches larger than the front piece to allow for that overlap. Prior to pinning and sewing the front and back pieces together, you will fold over, iron and stitch the hem of the envelope pieces, notice that hem in the above photo. I folded mine twice(for about a half inch hem) and ironed down prior to hemming. The back will look like this with that nice pocket to insert your pillow. I was thrilled to learn how to do this. There are three more accent pillows awaiting their turn. 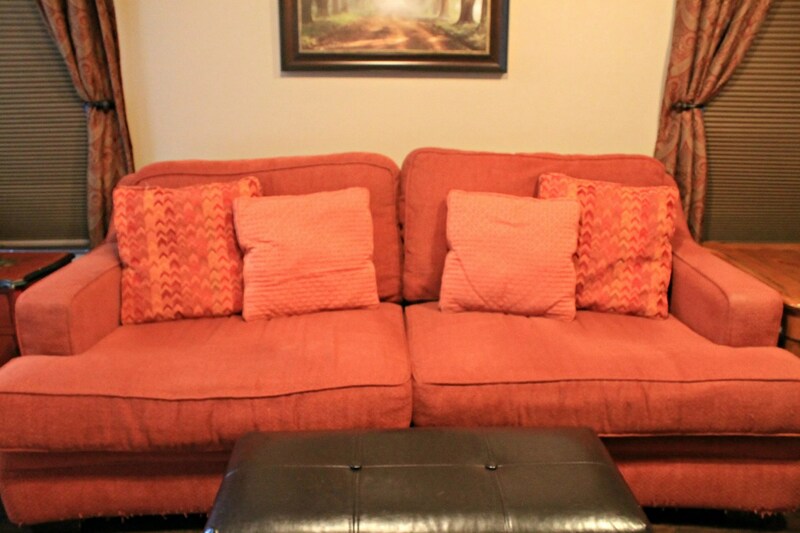 I call our red sofa a ‘wallering sofa’ because it is so comfy cozy, especially at nap time. My later uncle used to sleep on it when he visited preferring that sofa to the guest bedroom because it sleeps so well. I am inspired to continue my spring den decorating project since my envelope pillow covers turned out so well. I am planning a trip to the fabric store, my heart skips a beat just thinking about going to the fabric store, such a fun store to shop in! Keep an eye out for the finished project when I will show you the whole sofa with all the pretty new pillow covers along with all my other den spring decorating touches inspired by that little watering pot. If you are a visual learner like me, you share my appreciation for You Tube. 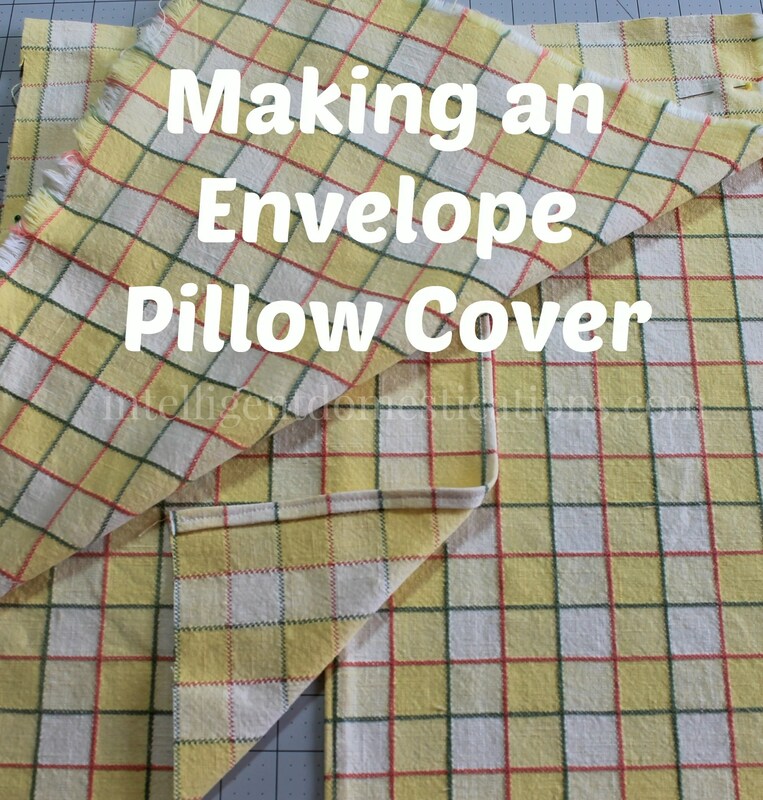 My You Tube channel is a growing list of how-to videos including the 3 minute video I watched to learn how to make an envelope pillow. You can find it on my channel here. This post is linked at the Spring Craft Blog Hop where you can find dozens of spring craft and decorating ideas! Wow Shirley! You really are learning to sew! Love it! Thanks for linking up with us at the Momma Told Me Link Party. We love it when you stop by! I am trying, that is for sure. I have discovered that I enjoy sewing and am coming up with things to make, so fun! What a great way to easily spruce up a room! Thanks for linking up at the #HomeMattersParty! During the Fall, was inspired to make pillow covers to change things up a bit. Well, I went to Jo-Anne store and bought all the material and made the covers (like yours). However, I think I the measurements were a tad small. And the Witch stitch thingy you iron on did not turn out so well either. I was so frustrated and gave up on the project:( Yours look lovely! Thanks for the tutorial, i’ve wanted to make some for a while now. I love your envelope pillows, Shirley! They are perfect for spring. I need to actually use my sewing machine and learn how to make these. Or maybe you could start an Etsy shop and I could buy them from you. 🙂 Great job. I don’t think I’m quite there yet to start an Etsy shop. If I can do it you can do it! I am having so much fun. You should give it a try. Really Cute! I’d like to make pillows like this for our bed. We need new ones once we get to re-doing that room. I’m pinning this for later! Thanks for the pin! Amanda you could probably do it yourself also. I want to make pillow covers for every pillow in the house now! I might make some for Christmas in particular.